‘Who has killed the headmaster of St Francis?’ - that was the question posed in an intriquing play by the primary school’s P7 class performed on Tuesday evening. The fascinating ‘crime’ even featured on the PSNI Craigavon Facebook page as junior detectives teamed up with the professionals. A video clip accompanied the PSNI post posing the eery question: “Who killed Mr Mc Morrow?”. Now Mr McMorrow, the principal, is a very popular teacher with an army of delightful children under his leadership and a squad of loyal teachers to aid him. On the job to try to solve the ‘whodunnit’ were a team of top detectives and clearly very clever investigative journalists. 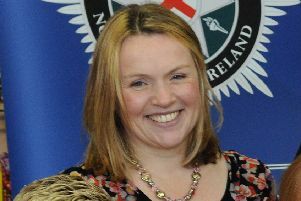 Top class investigator Adrienne Devlin enlisted her colleagues. The script was developed by Adrienne and her classmates: Maeve Scullion, Shania Creaney and Aoife McCavigan, with the P7 teachers putting the final shape to it. But the Lurgan Mail will not reveal who the ‘murderer’ is - as the second night of the St Francis’ PS play so as not to spoil anyone who has not yet seen the performance. Last night all the P7s and the whole school was buzzing as the show was finally produced and the ‘Big Reveal’ happened. The show is entirely unique and is a 50/50 mix of live performance and recorded action. The recorded sections have been professionally filmed by Paul Heaney of Armagh TV in a high quality production. “The children have come up with most of the ideas using Ant & Dec’s Saturday Night Show for inspiration. The ‘Who Killed Mr Mc Morrow’ segment has five internal suspects including caretaker Tommy Coleman and the secretly guarded script for this has been written and filmed in such a way that not even the children know whodunnit nor will they know until the ‘Big Reveal’,” said a spokesperson.